I got away from it a bit but this series used to be one where I’d point out upcoming Legendary creatures, their associated archetypes and cards bound to get used in those archetypal decks that have upside once people started building those decks. It was fun to write those pieces. It was also when we were getting spoilers of cool Commanders all the time. I had to write different articles to bridge the gaps between those cool spoilers and honestly, I didn’t see anything out of Shadows that made me super excited. Don’t get me wrong, Olivia is going to be a real clock in some format, I’m sure, but there’s no reason I want her over Olivia Voldaren. People seem excited about Avacyn but I don’t know if relying on blinking your commander in a deck that can’t have blue in it is wise and I’m not sure 3 damage matters a ton against every deck, although some decks you’re going to kill a million kobolds and take them to Fecundity town. People are excited about Arlin Kord and by that I mean non-EDH players are excited about Arlin Kord. Odric isn’t mythic for a reason. He’s a great inclusion but I can’t imagine building around a Concerted Effort with feet when the other Odric CHEATS AT MAGIC. 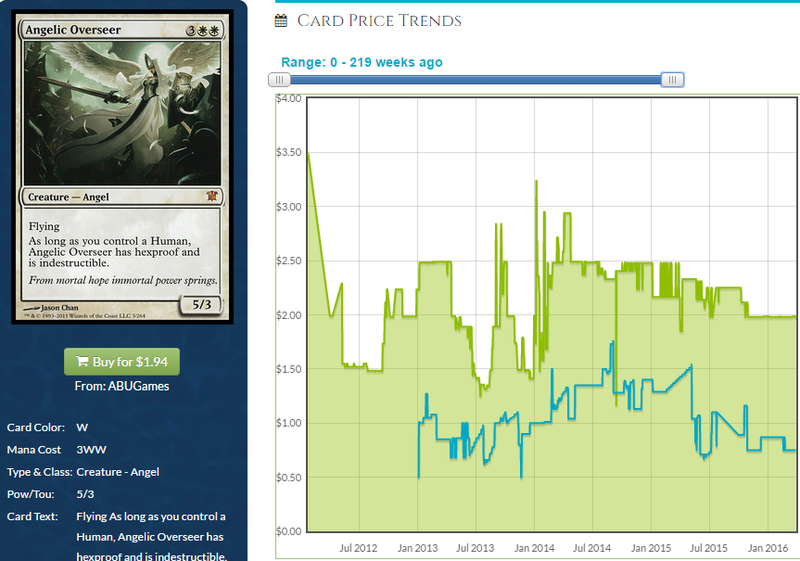 Sigarda is a slightly better Angelic Overseer that makes you play green whether you want to or not. About time we got another Angelic Overseer. 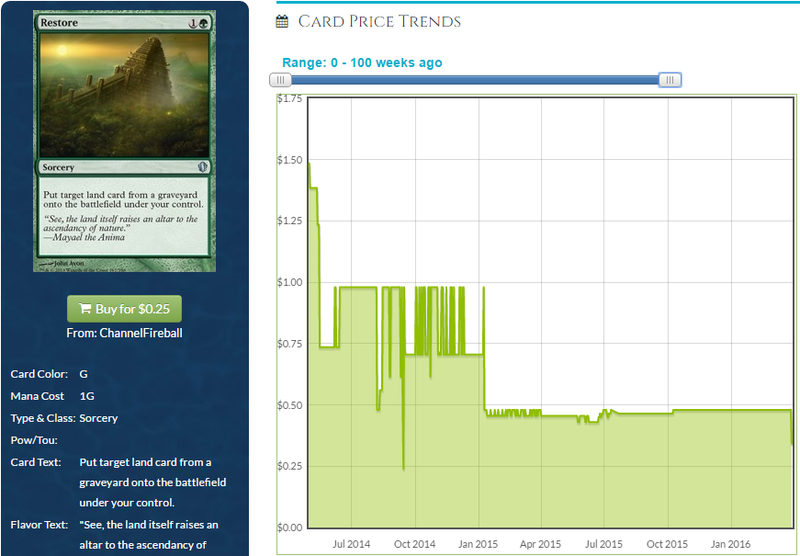 That’s in 0.012% of all eligible decks on EDHREC after all and is worth more than you might think. This card is aging like a fine milk. 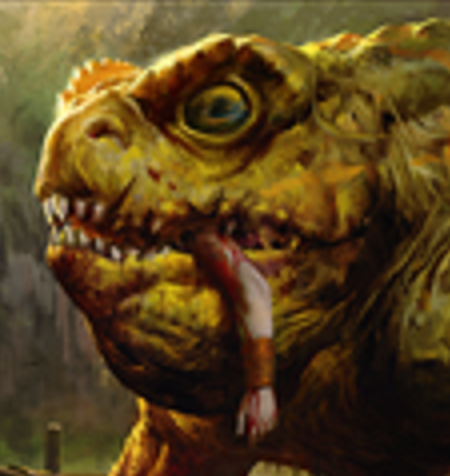 That basically only leaves us one Legendary creature worth giving a hot fart about. Fortunately for those who were looking forward to an article full of sicko picks, that one creature is worth ALL OF THE FARTS, irrespective of the temperature of those farts… annnnnd now I made myself sad with my gross metaphor. This card is a monster. Literally. IT HAS DEATHTOUCH BUT EATS DUDES ANYWAY. If you’re not hyped for this card, I’m sorry you snorted too many marijuanas and damaged the part of your brain that the rest of us use to experience joy. 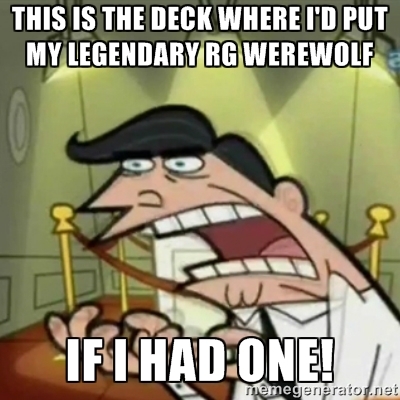 It’s called the Ventral Tegmental Area, but you wouldn’t know that because you’re too busy not being happy that they made a Legendary creature that makes up for how lackluster the rest of the Legendary creatures are AND the fact that there is no RG werewolf in the set (all signs point toward one named Ulrich being in the next set) AND the fact that delirium as a mechanic meant I was subjected to a bunch of halfwits posting all over Facebook that “OMG TRAGOMOYF CUD B N THIS SET GUISE” and that’s on you. If you make a comment about how the Ventral Tegmental Area is only one of the parts of the brain responsible for a complex emotion like joy, I will not read it and I will sign your e-mail address up for Gary Johnson e-mail updates because someone did that to me and it’s literally impossible to get your name taken off of that list. Don’t do it, nerd. 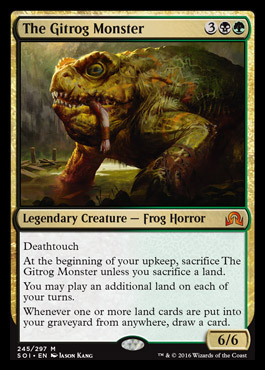 So’s as I was sayin’, Gitrog Monster is basically the only Legend from the set that people can really agree on. I’m sure some good writers whose opinion I respect are going to make a decent case for Avacyn or whatever, but everyone and their Magic-playing DAD be talkin’ ’bout that Gitmonster life. People are excited and when people are excited, prices move. But it’s not just the excitment, which is palpable, that I think The Gitrog Monster has going for it in the “make prices go crazy” department. 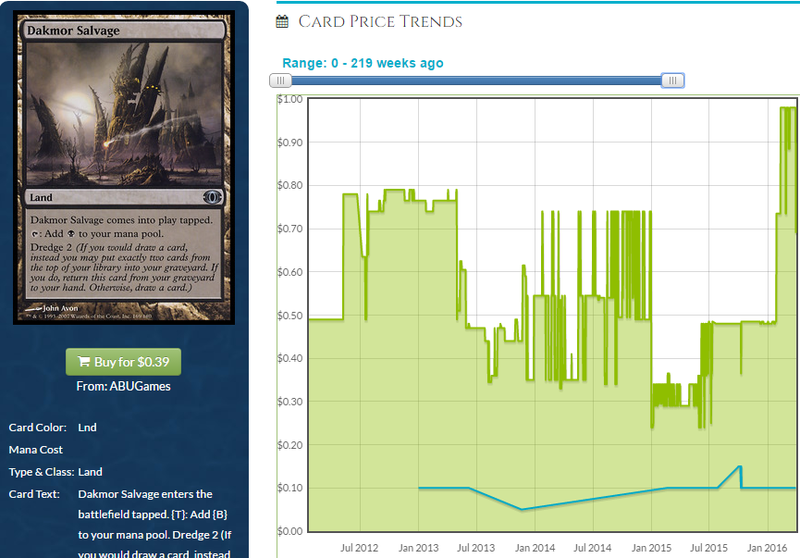 I think it’s also the linearity the deck at least implies. I am sure there are a ton of ways to build the deck. I brewed with it for Gathering Magic this week and thought it would be hilarious to run a bunch of effects that turn your lands into 2/2 creatures. You could run some reanimation stuff to dredge a Craterhoof into your yard then go full Nature’s Revolt with like 20 lands that are all 20+ power if you’re into winning the game that way. You could make infinite black mana with Skirge Familiar and Dakmor Salvage and Exsanguinate their faces. How you win is sort of up to you, but how you get there is less open to interpretation and that means we’re going to see some opportunity to make some money. There are some major things about to go down. What are the odds that everyone waits around to see if this is reprinted in Eternal Masters? It’s at least possible that this won’t be. It’s at least possible that people who want to go to Gitrog town (and what a town it is; an arm for every mouth hole) who have the $60+ bones to shell out are going to be impatient and are going to just make this card $100 soon. Every Gitrog monster basically needs Crucible. You can get by without one, but that’s basically admitting to the world that you’re a peasant, not that you’re a savvy deckbuilder who found a workaround. You didn’t find a workaround, you’re a poor. Embrace it, and sell plasma or whatever poors do and get yourself a Crucible. Or don’t, probably. I don’t like buying into a lot of uncertainty. If this is in Eternal Masters it probably stalls the growth for quite a while, especially if it’s in at non-mythic rare. If it is in at mythic or it’s not reprinted, the price won’t go down much if at all (or in the case of not reprinted, Hypnotoad should spike it) but if it’s in at regular rare, you can lose a lot of money here. This is an important card but the future is murky and I’m not parking money here. 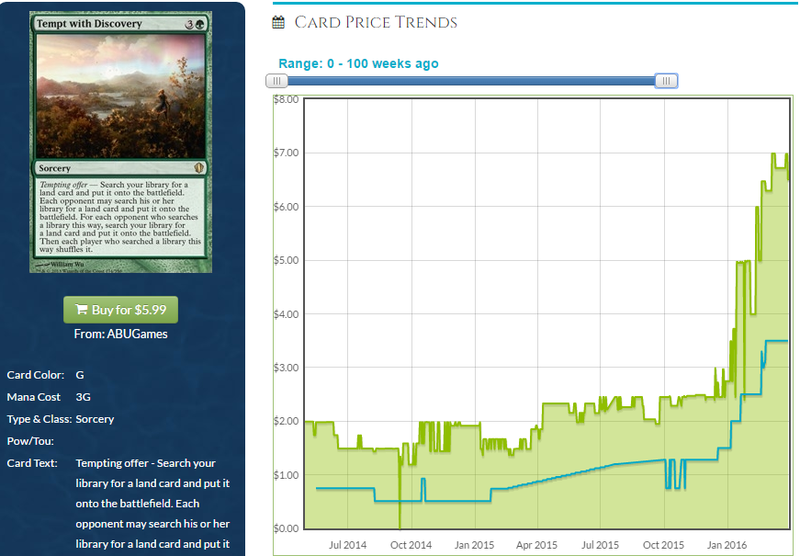 I think you watch spoilers carefully, though, because the second Crucible is ruled out, the price goes up instantly. This guy on the other hand has had two reprintings and neither one of them was all that successful at keeping the price down. This card is a proven winner and with its reprint risk being super low and its playability in Gitrog decks super high, it’s fairly obvious this price has nowhere to go but up. At $10 there are a lot worse places to park your money. I like this as a pickup quite a bit since it’s pretty easy money, although with hella copies out there it’s hard to say how much upside there is. We’re certain to see movement but maybe your $10 is better spent elsewhere if you want to really rake in off of a hit. 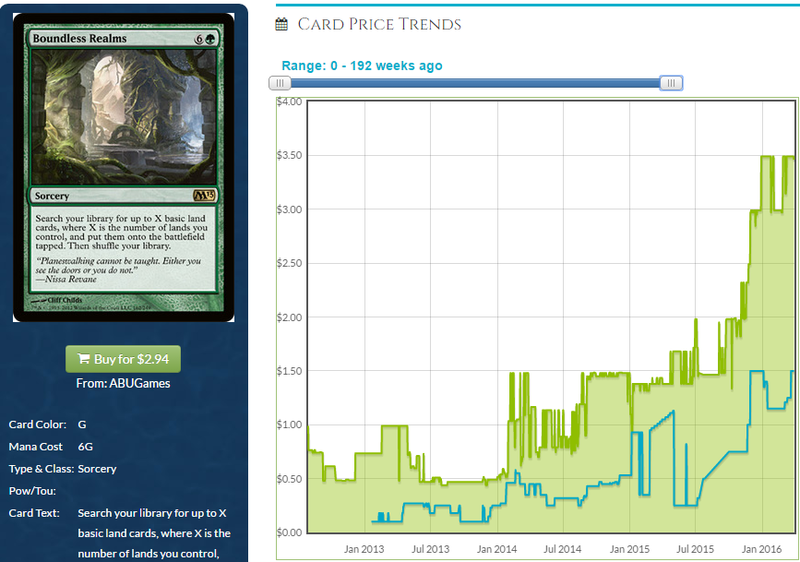 This is low risk but the reward is correspondingly low and the impact will be cushioned by the duel decks copies. 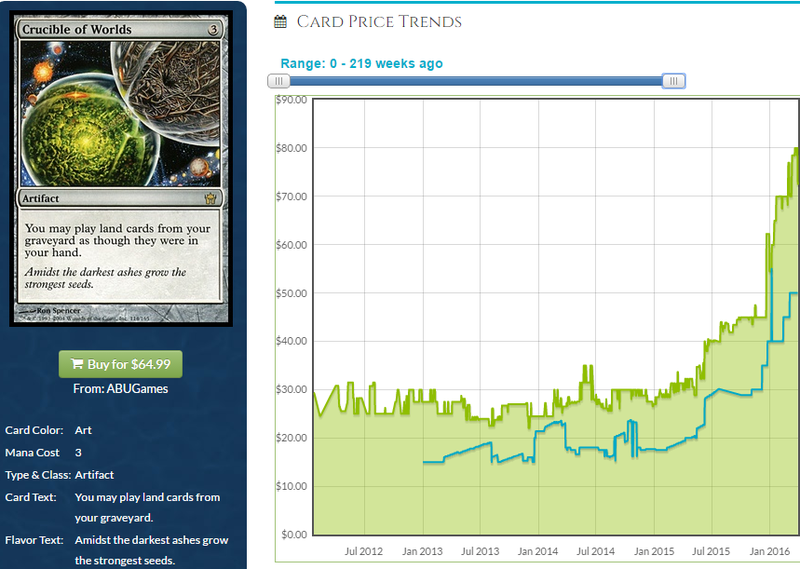 Those duel decks, while we’re talking about it, look really, really good if Life hits $15. If you can still get them for $20, Izzet vs Golgari has Jarad, Niv-Mizzet, Brainstorm, Fire//Ice, Isochron Scepter, Prophetic Bolt, Sphinx-Bone Wand, Dakmor Salvage, Eternal Witness, Golgari Grave Troll, a couple of Purefy and Izzet and Golgari Signets that look better than the Ravnica versions. I see Japanese copies of the duel deck on eBay for $23 right now, and if Dakmor Salvage and Life go up from The Gitrog Monster, you’re shipping the rest of those good for pure profit. I bought a few Target stores completely out of them a while back and have been sitting on them ever since but with English copies already going for $30, I may just take my 50% profit (more because I used someone’s employee discount to save 10% – it’s good to know people) and get out. This card has been printed as often as Life from the Loam and at a lower rarity so there is a lot of push needed to get these going, but reports are already coming in that buylist prices are up on these. I think it will take a heap of copies moving to trigger TCG Player, but as soon as someone buys it out, every amateur financier is going to buy out the rest of the loose copies on the net. The “Oh, Gitrog did this” analysis after the fact even if what really happened was someone just spending a few hundred bucks will get everyone else to buy. I don’t like this effect of sites like reddit but we can’t pretend it doesn’t happen so it pays to be prepared. I think this card is going to move. On a related note, if you go after foils, there is more potential upside and foils negate the influence of the duel deck printings, although the foils from Modern Masters hurt the upside of the Future Sight foils a bit. Still food for thought. Another must-run card, this is flat and has nowhere to go but up. I am sure there are a lot of copies on TCG Player since this was in 3 of the decks but this is a penny stock that is likely to move and I would be remiss if I mentioned Dakmor Salvage and not this. If there were foils of this available, I’d be about it. But there aren’t. Let’s move on to another important card of which there are no foils. There is real potential money here. First of all, this can fuel infinite combos with the deck, draw you cards, get you mana and generally make all of your filthy Golgari dreams come true. Gitrog players know this card is bananas in the deck and they’re chirping about it all over reddit and twitter. 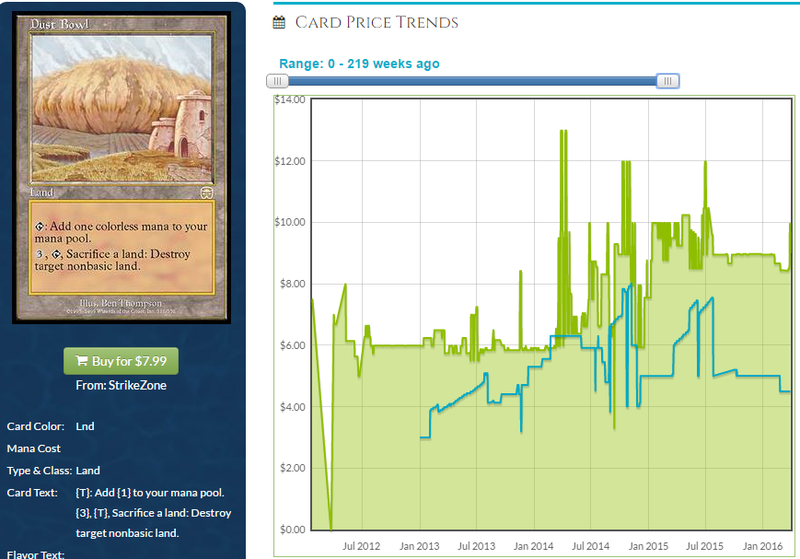 The crazy thing is, it’s drawing so much attention that people running other combo decks are starting to take a look. Any additional attention from other decks is going to have a huge effect on price. This is on the Reserved List so it’s never getting reprinted, it’s from Mirage block so there aren’t really many copies and it’s bound to get played a lot in the near future. 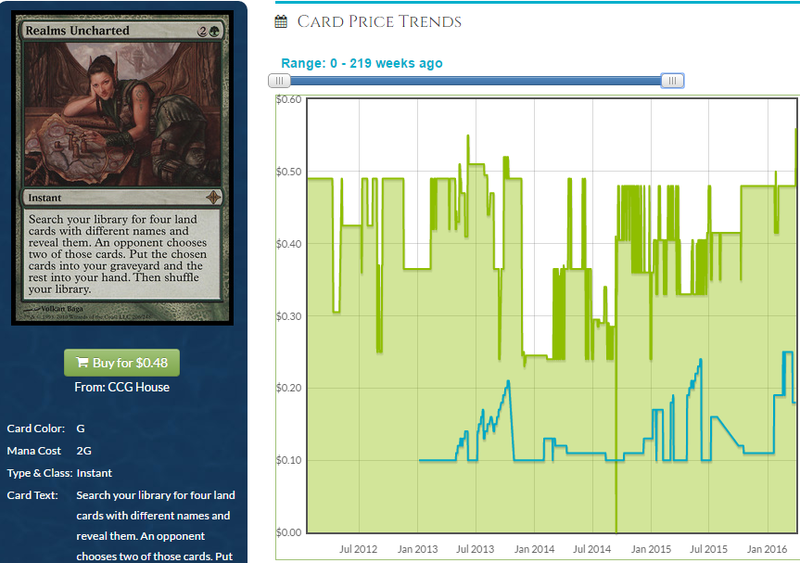 I’ve seen nearly identical cards to this one spike on flimsier premises. We saw one this week. Mirage block? Check. Reserved List? Check. Rare? Check. Only EDH play? Check. Someone mentioned this could potentially hose Eldrazi decks in Legacy and that was all it took for the finance followers to strip the internet of every loose copy. I don’t know if Squandered Resources will hit $20 as fast just because we don’t have the Legacy crowd making dumb buys, but people got really smug with me when I pointed out that Hall of Gemstones is in like 0 decks on EDHREC. They saw it mentioned on MTG Salvation, you guys. It’s a real card. OK, Squandered Resources is a card, too, and it’s nearly identical to Hall of Gemstones in every way. It’s also going to get played a ton in a deck that I’m fairly certain will be the most-built deck of the month as soon as it’s out. 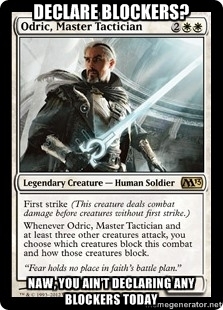 Unlike Meren which had competition from all the other Commander 2015 commanders and Ayli which had competition from Tazri, Gitrog is all alone. It’s the only card anyone seems to give a rip about in terms of EDH commanders which means the decklists will be everywhere. I think Squandered Resources is a no-brainer and unlike Crucible, we can see essentially exactly where it’s headed. This is on its way up, already. Imagine where it’s headed after Gitrog enters all of our lives. I think there’s upside on this card and it’s something EDH was already aware of. To the extent that this happened. We got an expedition. 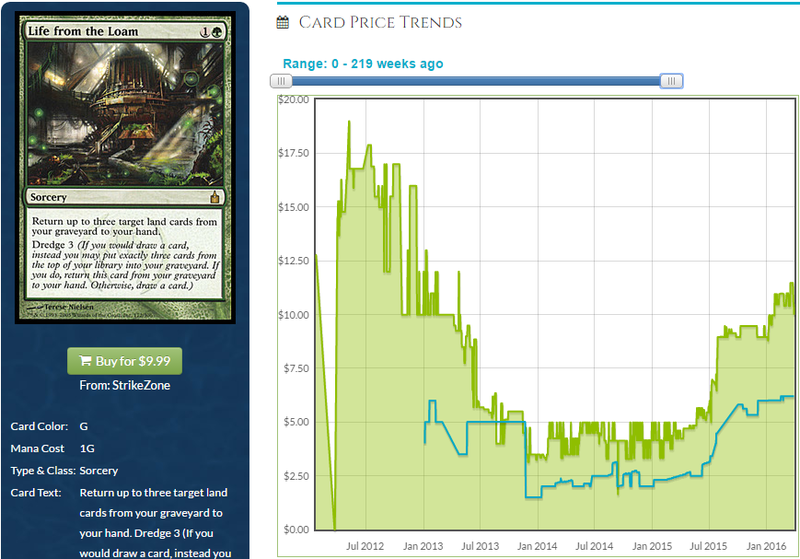 Could Gitrog reverse this expedition’s slow decline? I don’t know. There is a set foil at only $70 which is way more pimp than this expedition which is, like, Michael Shannon ugly. It’s so bad. It’s like road rash ugly. It’s so bad that if my daughter drew this I wouldn’t put it on the refrigerator. You remember those books, Scary Stories to Tell in the Dark? Remember that art? This is worse than that. Spend the extra coin and buy the set foil if you’re going to trifle with this ballbag of an expedition. Seriously. This art is uglier than if Steve Buscemi fell asleep on someone’s leg at a party and that person was wearing corduroy pants and Steve woke up and noticed he had lines on his face and thought “wow, this looks really bad” right before someone splashed acid on his face because they thought Boardwalk Empire was real. Wasn’t Michael Shannon on Boardwalk Empire, too? And a dude with half his face blown off by a sniper? That’s an ugly show. When Michael K Williams is the best-looking person on your show, your show is messed up. It’s still better than this art. I wrote like 200 extra words I’m not getting paid for because I hate this art so much. Some person worked really hard on this art and they probably did exactly what the art director who hired them told them to do. I don’t even care. Everyone responsible for this expedition utterly, UTTERLY failed in every way. I’m not one for recommending you stay away from an expedition but, stay away from this. This one is running long but it’s my article and I’ll run long if I want. Few more cards. 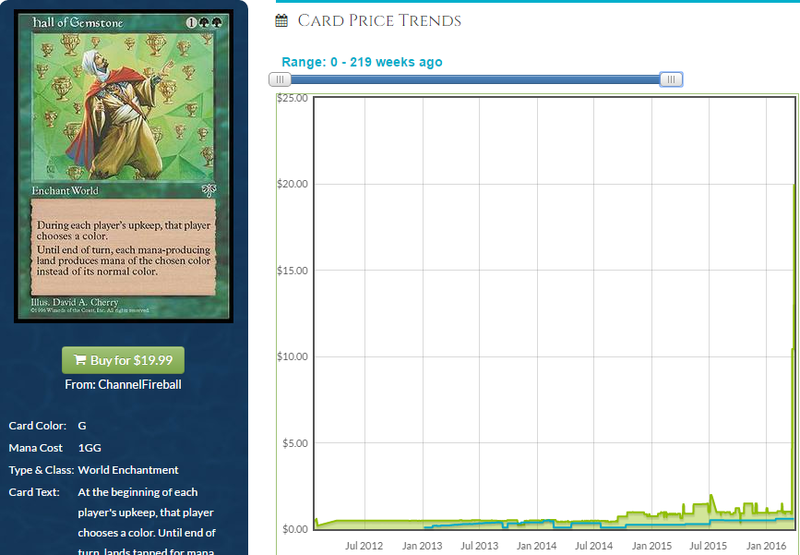 Look at this graph shape and inevitable inclusion in the deck, etc. Man, I’m starting to regret not being more conservative with my word count earlier. This is a good card and you should buy it if you want to. Or not, I don’t care. But this goes in the deck. I call this card every few months and I’m always right. Eventually people are going to stop letting me pretend I can be right with a pick more than once. This goes in the deck, but it’s going up regardless. The only difference is the slope of the graph. I still like this at $3. Spend $45 and you’ll be glad you did. I’m over my word count. Let’s call it an article right here. I think he makes a good point. Realms probably has more upside than a mere double up since it’s going in Gitrog decks because it does a lot of what you want. I was going to mention a new card like Fork in the Road just for being a cantripy Farseek so why not Realms Uncharted? I think what Travis did was point to a bit of subconcious bias on my part. Realms is a card a lot of us have wanted to get there forever and it has resisted any pressure so far. It just won’t go up. Azusa couldn’t do it, Mina and Denn couldn’t do it, Boborygmos couldn’t do it. It’s almost like I gave up on Realms Uncharted. It wouldn’t pull itself up by its bootstraps so I decided it will never be worth money. I think Realms Uncharted probably has more upside than Restore, a card I am relatively bullish on. Foils are a 10x multiplier, and at a $5 buy-in, you can make real money if the non-foil hits a few bucks and we maintain the multiplier, which is reasonable. I should like Realms more, and I think you should, too. Don’t let a card’s past behavior make you resist re-evaluating it in light of new developments, since that’s literally what we do in this column. I missed this the first few times but Gitrog says draw a card when 1 or more land cards is put into your graveyard from ANYWHERE. So I’m reading uncharted realms as filter 4 lands out of your deck get two lands and draw a card. Doesn’t seem horrible for a Gitrog deck. Not the best, but cute tech and on theme. Holy crud, Squandered Resources is now GONE from ebay, at least those shipping to Australia. That is POWER. 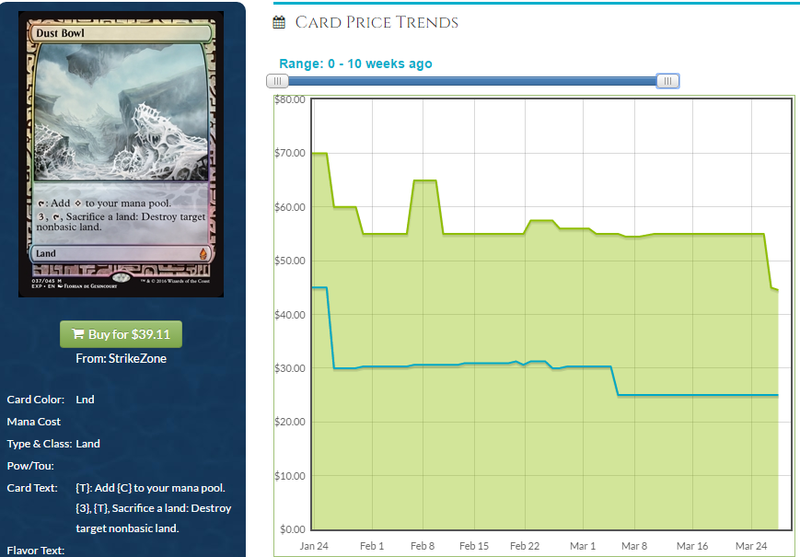 Hmm, looks like Torpor Orb and Rest in Peace might be going back into my deck. Any other GY hate cards that might have upside. I know Nihil Spellbomb and Relic of Progenitus is good, maybe Scavenging Ooze? Its pretty much time to mainboard GY hate don’t you think? Tasigur, Sidisi, Gitrog… Some pretty strong GY shenanigans coming out over the past year or two. 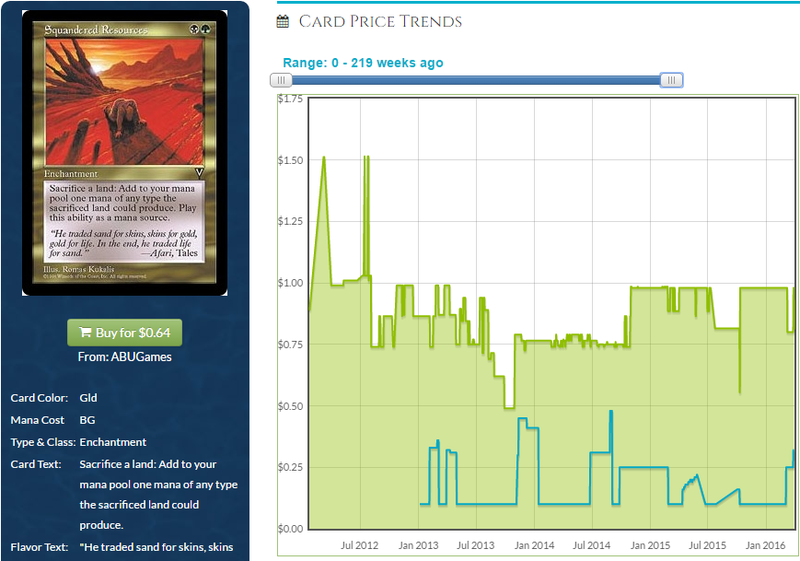 Wow i added squandered resources to my want list on Pucatrade at 64 points on March 29th. April first its now 582 points! You are not wrong about it being a real card, or boats! You guys need to be really careful. 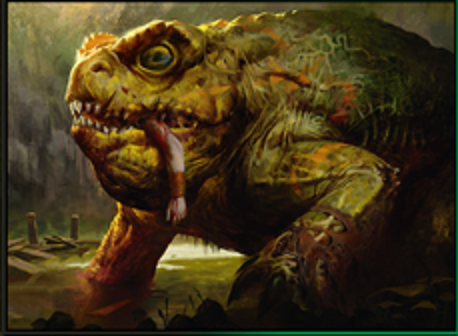 Depending on how you set up your Gitrog deck, you might be barred from using it at a tournament due to slow play rules. The discussion as to why is a bit beyond this thread, but suffice to say that if you ever try to go infinite with Toad, you probably are using a reshuffle-the-yard effect like Emrakul or Gaea’s Blessing. And, once you do that, you might be given a slow play warning and told to stop the combo.